I am very pleased to share this new article with José Antonio López-Sáez and colleagues: DOI:10.1002/ldr.2751 about the fire history of a mountain range in central Spain. The use of fire and, consequently, its severity and incidence on the environment, has grown steadily during the last millennia throughout the Mediterranean. This issue can be assessed in several mountain ranges of central Iberia where changes in the management policy on anthropic activities and exploitation of high-mountain environments have promoted a remarkable increase on fire frequency. Our research focuses on fire dynamics throughout the last three thousand years from three peat bog charcoal records of the Gredos range (central Iberia). Our aim is to reconstruct past fire regimes according to forest vegetation typology (Castanea sativa, Pinus pinaster, P. sylvestris). Charcoal influx shows low values between 3140 and 1800 cal. yr BP when forests were relatively dense both in high and mid-mountain areas. Fire appeared synchronous between 1800 and 1700 cal. yr BP for Lanzahíta and Serranillos and around 1400-1240 cal. yr BP for the three sites suggesting anthropogenic fire control between the Late Roman and the Visigothic periods that can be related to the cultivation of olive trees in the valleys and a greater human impact in high-mountain areas. By contrast, during the Muslim period (1240-850 cal. yr BP) fire dynamics becomes asynchronous. Later, fires turn again coeval in the Gredos range during the Christian period (850-500 cal. 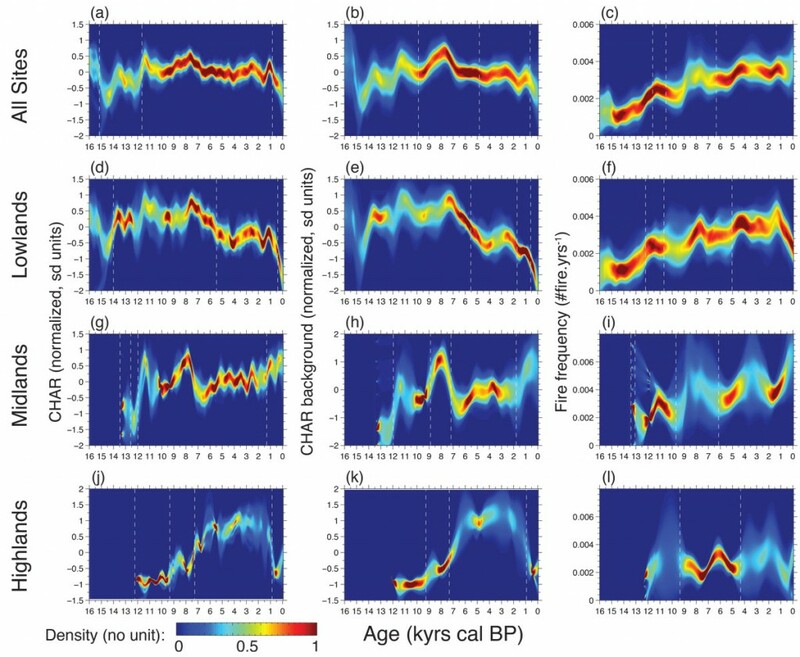 yr BP) and can be also correlated with drought phases during the Late Medieval Warm Episode. In short, our study demonstrates that fire activity has been enormously variable during the late Holocene in response to both short- and long-term regional and global climate, vegetation dynamics and land use changes. Abstract: Progresses in reconstructing Earth’s history of biomass burning has motivated the development of a modern charcoal dataset covering the last decades through a community-based initiative called the Global Modern Charcoal Dataset (GMCD). As the frequency, intensity and spatial scale of fires are predicted to increase regionally and globally in conjunction with changing climate, anthropogenic activities and land-use patterns, there is an increasing need to further understand, calibrate and interrogate recent and past fire regimes as related to changing fire emissions and changing carbon sources and sinks. Discussions at the PAGES Global Paleofire Working Group workshop 2015, including paleoecologists, numerical modelers, statisticians, paleoclimatologists, archeologists, and anthropologists, identified an urgent need for an open, standardized, quality-controlled and globally representative dataset of modern sedimentary charcoal and other sediment-based fire proxies. This dataset fits into a gap between metrics of biomass burning indicators, current fire regimes and land cover, and carbon emissions inventories. The dataset will enable the calibration of paleofire data with other modern datasets including: data of satellite derived fire occurrence, vegetation patterns and species diversity, land cover change, and a range of sources capturing biochemical cycling. Standardized protocols are presented for collecting and analyzing sediment-based fire proxies, including charcoal, levoglucosan, black carbon, and soot. The GMCD will provide a publically-accessible repository of modern fire sediment surface samples in all terrestrial ecosystems. 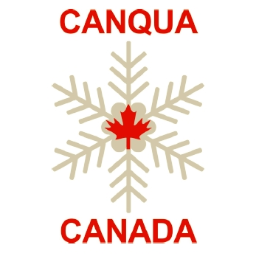 Sample collection and contributions to the dataset will be solicited from lacustrine, peat, marine, glacial, or other sediments, from a wide variety of ecosystems and geographic locations. Ref: Hawthorne, D., Courtney Mustaphi, C. J., Aleman, J. C., Blarquez, O., Colombaroli, D., Daniau, A.-L., Marlon, J. R., Power, M., Vannière, B., Han, Y., Hantson, S., Kehrwald, N., Magi, B., Yue, X., Carcaillet, C., Marchant, R., Ogunkoya, A., Githumbi, E. N. and Muriuki, R. M. (no date) ‘Global Modern Charcoal Dataset (GMCD): A tool for exploring proxy-fire linkages and spatial patterns of biomass burning’, Quaternary International. doi: http://doi.org/10.1016/j.quaint.2017.03.046. I am pleased to share this new article with Julie Aleman and Carla Staver: DOI: 10.1111/gcb.13299 (preprint) about modelling of future tree cover in sub-Saharan Africa. Global change will likely affect savanna and forest structure and distributions, with implications for diversity within both biomes. Few studies have examined the impacts of both expected precipitation and land-use changes on vegetation structure in the future, despite their likely severity. Here we modeled tree cover in Sub-Saharan Africa, as a proxy for vegetation structure and land cover change, using climatic, edaphic and anthropic data (R2 = 0.97). Projected tree cover for the year 2070, simulated using scenarios that include climate and land-use projections, generally decreased, both in forest and savanna, although the directionality of changes varied locally. The main driver of tree cover changes was land-use change; the effects of precipitation change were minor by comparison. 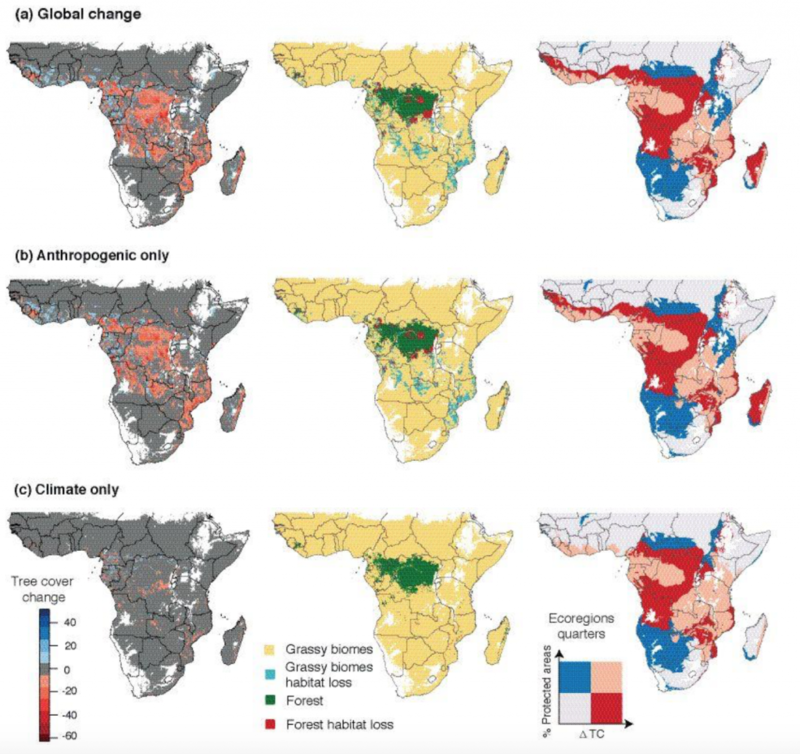 Interestingly, carbon emissions mitigation via increasing biofuels production resulted in decreases in tree cover, more severe than scenarios with more intense precipitation change, especially within savannas. Evaluation of tree cover change against protected area extent at the WWF Ecoregion scale suggested areas of high biodiversity and ecosystem services concern. Those forests most vulnerable to large decreases in tree cover were also highly protected, potentially buffering the effects of global change. Meanwhile, savannas, especially where they immediately bordered forests (e.g. West and Central Africa), were characterized by a dearth of protected areas, making them highly vulnerable. Savanna must become an explicit policy priority in the face of climate and land use change if conservation and livelihoods are to remain viable into the next century. Figure 3 | Tree cover change projections from 2000-2070 – RCP 2.6 (left maps), biome distribution shifts based on tree cover changes (middle), and WWF Ecoregion conservation risk based on tree cover change and protected area coverage (right). Projections are based on climate and anthropogenic change together (a), anthropogenic change only (b) and climate change only (c). Les données sont disponibles via une application web ici. 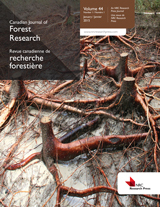 Abstract: Forest ecosystems in eastern Canada are particularly sensitive to climate change and may shift from carbon sinks to carbon sources in the coming decades. Understanding how forest biomass responded to past climate change is thus of crucial interest. But past biomass reconstruction still represents a challenge. Here we used transfer functions based on modern pollen assemblages and remote sensed biomass estimation to reconstruct and quantify, for the last 14 000 years, tree biomass dynamics for the six main tree genera of the boreal and mixed-wood forests (Abies, Acer, Betula, Picea, Pinus, Populus). We compared the mean genera and total biomass to climatic (summer temperatures and annual precipitation), physical (CO2, insolation, ice area) and disturbance (burned biomass) variables, to identify the potential drivers influencing the long-term trends in tree biomass. Tree biomass was for most genera related with summer temperature, insolation and CO2 levels; Picea was the exception and its biomass also correlated with annual precipitation. At the onset of the Holocene and during the Holocene Thermal Maximum c. 10000-6000 BP), tree biomass tracked the melting of the Laurentide Ice sheet with high values (>50 t.ha-1 and a total of 12 Pg). These values, in the range of modern forest ecosystems biomass, indicate that trees were probably able to survive in a periglacial environment and to colonize the region without any discernible lag by tracking the ice retreat. High biomass at the beginning of the Holocene was likely favoured by higher than present insolation, CO2 levels higher than during the Last Glacial Maximum, and temperature and precipitation close to present day levels. Past tree biomass reconstruction thus brings novel insights about the drivers of postglacial tree biomass and the overall biogeography of the region since the deglaciation. Legend: Temporal trend of mean genera biomass compared to climatic and physical variables. 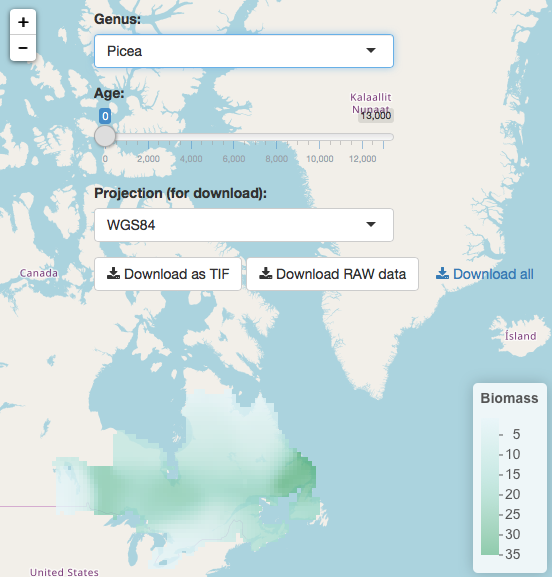 (a) Mean tree genera biomass temporal trends obtained by fitting a LOWESS (with a 200 years half window width) on reconstructed biomass from all sites. (b) Total biomass in 1000 years windows obtained by calculating the total biomass for each genera in each 50 $*$ 50 km pixel and then summing all pixel values within the studied territory. Total biomass values were expressed as petagrams (Pg) for convenience. (c) Biomass burning trend obtained by the analysis of charcoal series contained in the Global Charcoal Database. (d) Laurentide ice sheet area trend from (Dyke 2004). (e) NGRIP d18O record (grey line) and trend evaluated using 1000 years windows averages (plain red line). (f) Epica Dome C CO2 from (Monnin et al. 2004). Summer (june, july, august) temperatures (g) and annual precipitation (h) anomalies from the HadCM3 and CCSM3 GCM experiments. (i) Summer (JJA) insolation anomalies at 45° N.
• 18 southern European charcoal records document 16,000 years of fire regime changes. 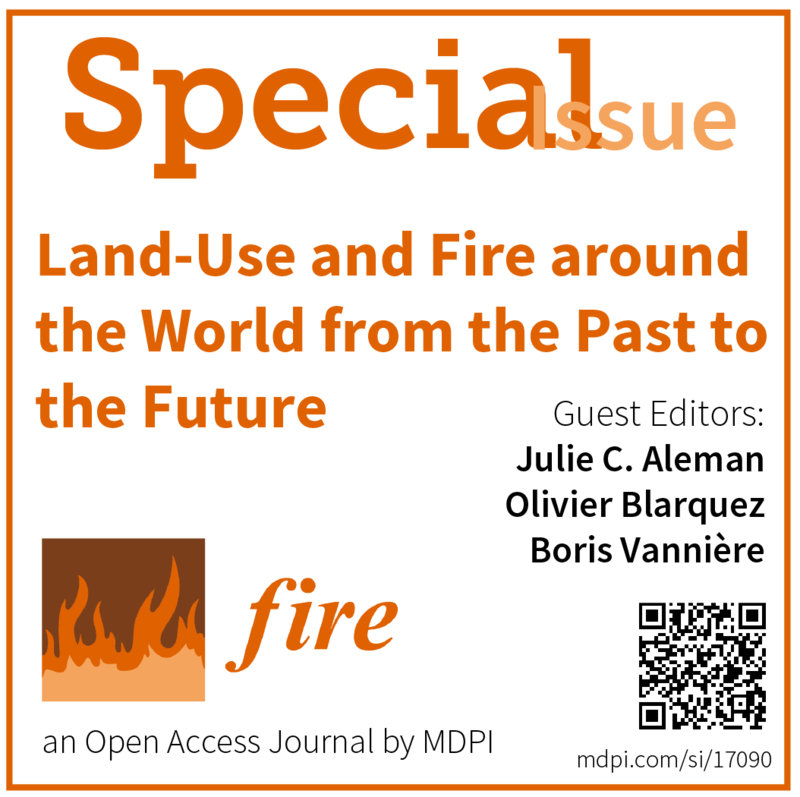 • Since the Neolithic, land uses have artificially maintained high fire frequencies. • Human-induced decreases in forest cover led to a reduction in the biomass burned. • Human-modified landscapes affected ecological processes more meaningly than expected. Vannière B., Blarquez O., Rius D., Doyen E., Brücher T., Colombaroli D., Connor S., Feurdean A., Hickler T., Lemmen C., Leys B., Massa C., Olofsson J. 2015. The human legacies of elevation-dependant European fire regimes. Quaternary Science Reviews. 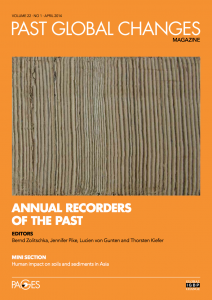 DOI: doi:10.1016/j.quascirev.2015.11.012. Fire regime proxy series through time (Fig. S1, S2 and S3). Density distribution of Charcoal Accumulation Rate Z-scores (CHAR), biomass burned and fire frequency proxies for all sites (a to c), for lowland sites (d to f), midland sites (g to i) and highland sites (j to l). The color scale translates the density of the proxy site-records at each time step; cold colors are indicative of data dispersion and thus capture the heterogeneity among sites; hot colors indicate site response homogeneity and thus spatial uniformity. The white dotted lines separate time periods with significant differences in the proxies’ mean and variance (see Materials and Methods). All ages are expressed in calibrated kilo-years Before the Present (conventionally fixed at 1950 AD). I am pleased to announce the publication of a new study in Computers and Geosciences with Boris Vannière, Jennifer Marlon, Anne-Laure Daniau, Mitch Power, Simon Brewer and Patrick Bartlein. The paper is freely available online here until October 19 and soon as a package vignette for paleofire. • We present the open source paleofire R package for analysis of sedimentary charcoal series. • The package is used to analyse charcoal records from the Global Charcoal Database. • The functions eases the steps for interrogating data contained within the GCD. • Analyses included charcoal series transformation (homogenization) and synthesis. • We describe paleofire by producing a regional synthesis of biomass burning in NE America. Vannière B., O. Blarquez, J. Marlon, A.-L. Daniau and M. Power. 2014. Multi-Scale Analyses of fire-climate- Vegetation Interactions on Millennial Scales. PAGES Magazine, Volume 22, Page 40. The article presents the workshop of the Global Paleofire Working Group held in Frasne (France) on 2-6 October 2013 that was supported by PAGES. The pdf of the article can be downloaded here or directly from the PAGES website. I am pleased to announce the publication of a new study in Frontiers in Ecology and Evolution with Christopher Carcaillet, Thibaut Frejaville and Yves Bergeron. The paper is freely available online here. Assessment of biodiversity in a changing world is a key issue and studies on the processes and factors influencing its history at relevant time scales are needed. In this study, we analysed temporal trends of plant diversity using fossil pollen records from the North American boreal forest-taiga biome (NABT). We selected 205 pollen records spanning the last 15,500 years. Diversity was decomposed into α and γ richness, and β diversity, using Shannon entropy indices. We investigated temporal and spatial patterns of β diversity by decomposing it into independent turnover (variation in taxonomic composition due to species replacements) and nestedness (variation due to species loss) components. The palynological diversity of the NABT biome experienced major rearrangements during the Lateglacial and early Holocene in response to major climatic shifts. The β nestedness likely reflected plant immigration processes and generally peaked before the β turnover value, which mirrors spatial and temporal community sorting related to environmental conditions and specific habitat constraints. Palynological diversity was generally maximal during the Lateglacial and the early Holocene and decreased progressively during the Holocene. These results are discussed according to macro-ecological processes, such as immigration, disturbances and environmental fluctuations, with climate most notably as the main ecological driver at millennial scales.